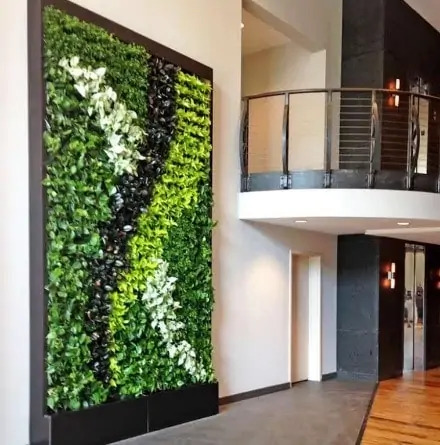 Living green walls (also known as vertical gardens) are an emerging architectural design trend in the urban built environment. They bring the benefits of nature to commercial settings and office buildings, both inside and out. The benefits are not only for the people who work in these buildings, but for the environment as well. Biophilia refers to the innate tendency for people to seek connections with nature. Our busy, overcommitted lives lead to stress, poor health and the need to recharge and refocus. To do so, most of us look to nature and are gratified spending time in the mountains, on beaches or in other outdoor spaces. We crave nature! Often, an outdoor walk after work or weekend hike satisfies this craving. But in the confines of the workweek, daily doses of indoor nature in the built environment provides the same effect as being outdoors. It clears our mind, reduces stress and increases our energy level. Several studies show that plants in the workplace are more than just aesthetically pleasing, they improve employee performance. Recent research has found that people have an increased ability to concentrate and are more creative when working in an office with indoor foliage. Living green walls are impactful and dramatic! Employees and visitors marvel at the lush greenery and calming displays. Creatively designed vertical gardens provide attractive color, texture and incredibly stunning displays. The emerging living green wall trend requires design inspiration and an in-depth knowledge of plant species that work. With proper selections, the results will be spectacular! We spend up to 90% of our time indoors with stale, recirculated air. The Environmental Protection Agency (EPA) estimates indoor air pollution two to five times higher than outdoor air leading to “Sick Building Syndrome.” Live plants through their natural photosynthetic process generate oxygen and fresh air. Plants remove harmful gases such as carbon monoxide, formaldehyde, benzene and many other VOCs resulting from building materials, finishes and furniture. 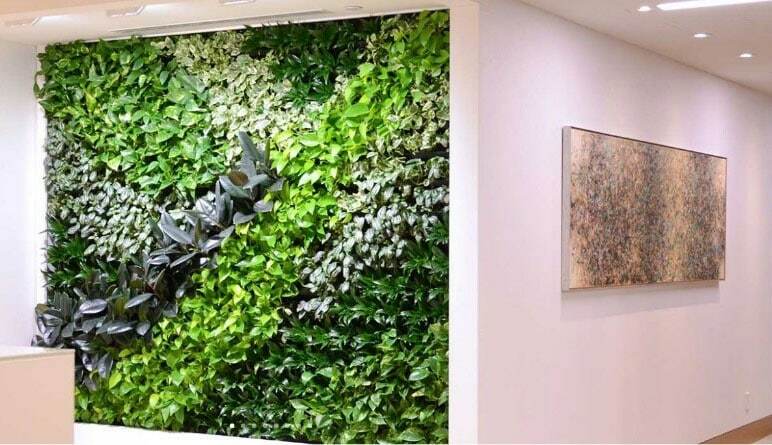 By absorbing pollutants, naturally produced fresh air from a living green wall provides a healthy work environment contributing to employee wellbeing and increased productivity. We need intimate areas at work to meet and collaborate. Modern open office design encourages employee interaction and spontaneous conversation, but often leads to noise and distraction. 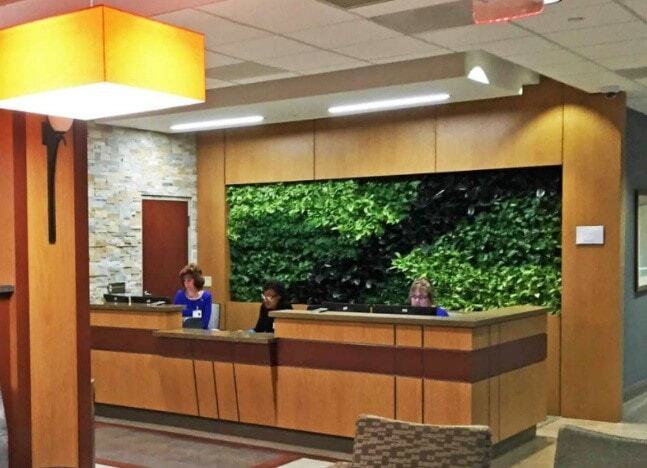 One way to reduce unwanted noise in buildings is with the use of plants. 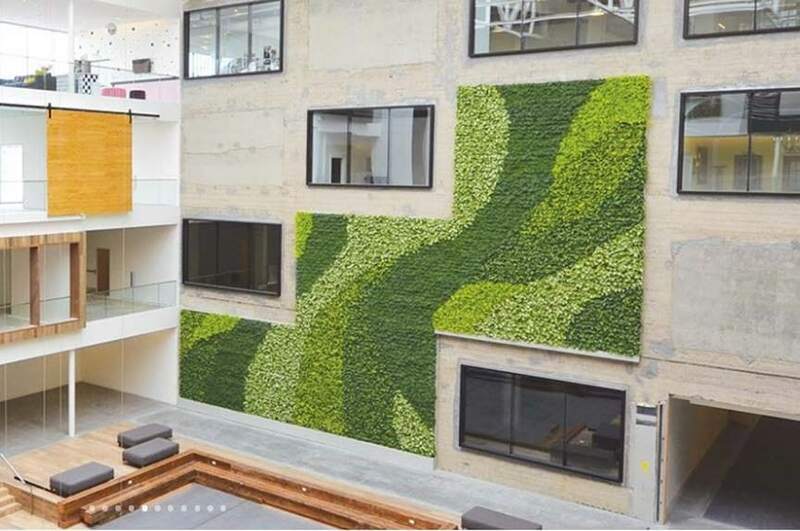 Living green walls contribute to overall noise reduction by absorbing, diffracting and reflecting sound waves. The result is intimate, quiet spaces that encourage focused energy and creativity. Leadership in Energy and Environmental Design (LEED) is a rating system devised by the United States Green Building Council (USGBC) to evaluate the environmental performance of a building and encourage sustainable design. Planted walls can make the building more energy efficient by providing a shield from strong summer sunlight and provide protective insulation during the winter months. This reduces energy consumption and the building’s carbon footprint. Exterior living green walls also provide a habitat for butterflies, ladybugs and small birds within their ecosystem. 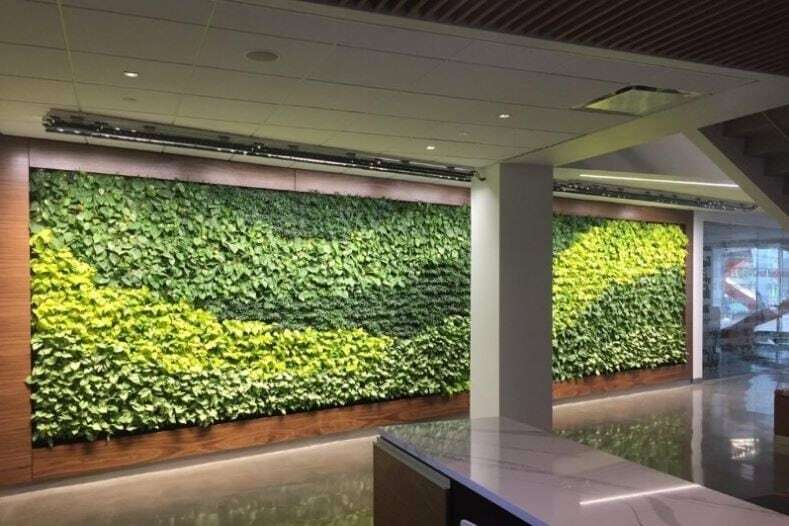 The use of living green walls can help a building to earn LEED points making it more attractive to occupants and increase the property’s overall value.